As an aging society begins to use more healthcare services, cost efficiency imperatives continue to put pressure on healthcare payers, providers and suppliers that has led to strict cost/performance and care guideline directives. 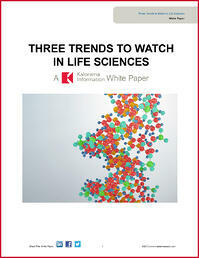 In this white paper, discover three of the most important life sciences industry trends. These trends are changing healthcare delivery, patient experience/outcome and which healthcare companies will prosper. Why there have been more than 105 acquisitions and distribution agreements in the IVD market in the last two years. How molecular medicine will transform the entire spectrum of disease management.